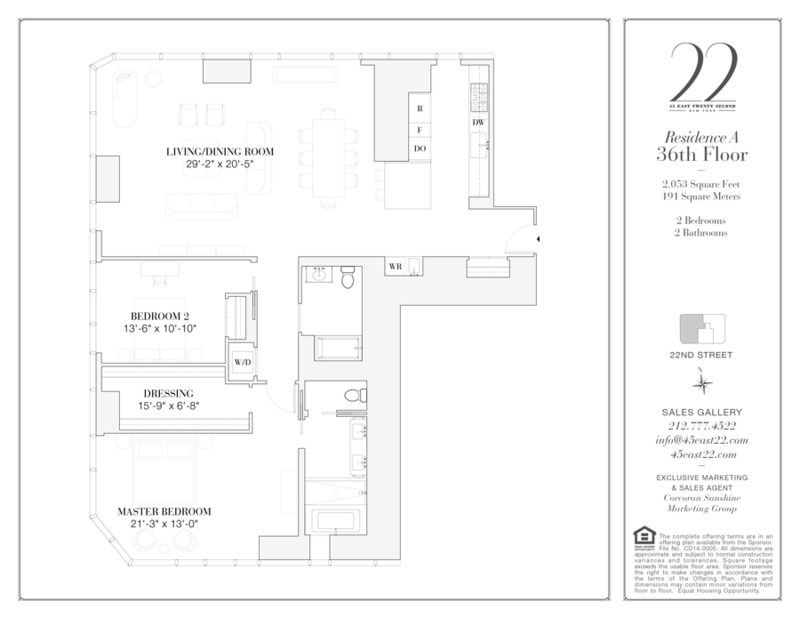 Situated on a semi-private floor, Unit 36A is a dramatic, 2053sqft view-inspired 2 bedrooms, 2 bath. Defined by high ceilings and sweeping exposures North, West and South, from this residence showcases beautiful sunsets and glittering Manhattan landmarks – Empire State, Clock Tower, and the Flatiron Building While capping off this boutique collection consisting of only 83 units, 45 East 22nd will take the crown for the finest views in the Flatiron/Madison Square Park district. 45 East 22nd is a short walk from Madison Square Park and Gramercy Park. Award-winning architectural giant, Kohn Pedersen Fox, responsible for creating masterpieces including the Shanghai World Financial Center, designed an original: Manhattan's first cantilevered fluted glass sculpture engineered with chamfered corners to maximize views and create column-free interiors. Renowned interior designer, Martin Brudnizski, known for his brilliance in creating classic spaces by melding history with modernity, takes his cue from the Flatiron Building itself by creating distinctively soft, symmetrical and round interiors. Custom finishes throughout, including cabinetry by Molteni, honed Bleu de Savoie marble countertop and backsplash, White Mountain Danby marble bathroom countertop and flooring, custom Waterworks fixtures and soaking tub. The building features a live-in resident manager, on-site Luxury Attache concierge, and a 24-hour doorman. With 12,000sqft of amenities spanning over five floors have been curated with Martin's timeless vision, integrating ultra-luxurious decor. These include a full-floor fitness center, basketball court, golf simulator, playroom, library, billiards, cards room, terrace with outdoor grill landscaped by Oehme Van Sweden. 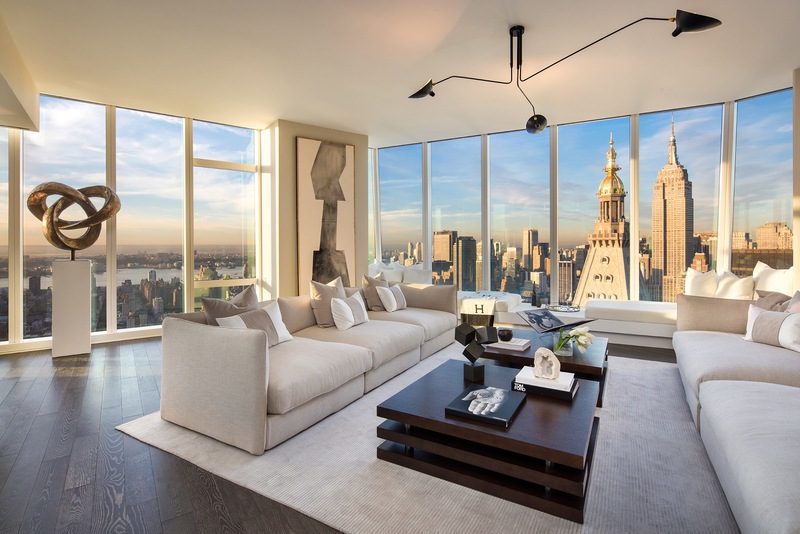 The Upper Club on the 54th floor is a one-of-a-kind, spectacular living and dining room with a beautifully appointed demonstration kitchen for residents use only, showcasing breathtaking panoramic views.